Sweet and Spicy Chicken Kabobs - What the Forks for Dinner? 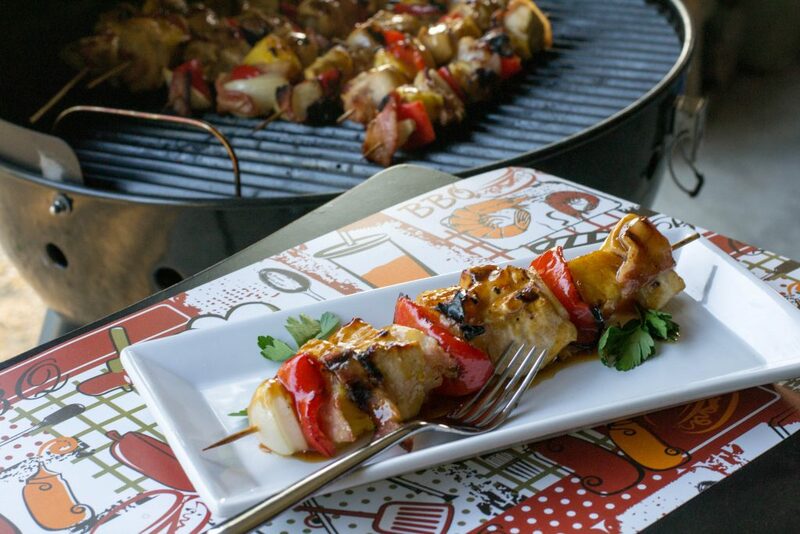 Whether Mother Nature like its or not, its time to grill…… Sweet and Spicy Chicken Kabobs. When boneless skinless chicken is on sale……. you stock up! After all you never know when a chicken idea will come across your mind. 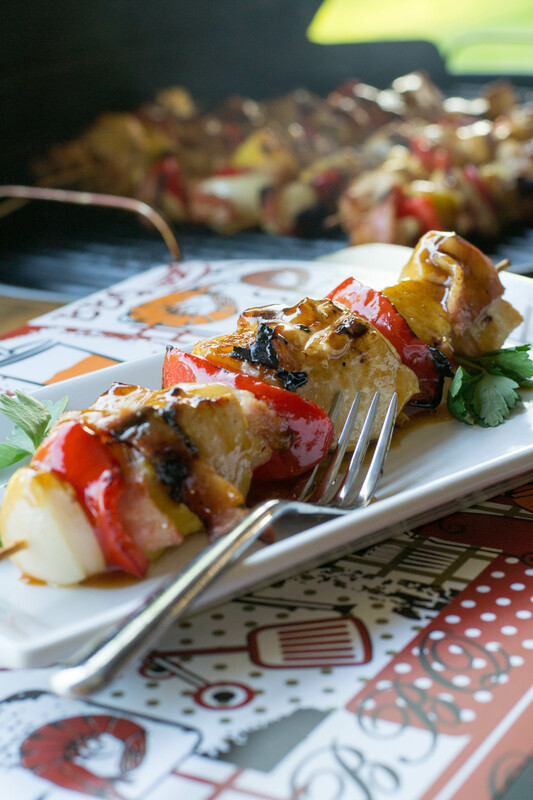 Kabobs are a perfect summer griller. I did not use them for this recipe as I only have two and we had a few more people than that for dinner, but if you can find kabob baskets……buy them. Much easier to turn, and nothing falls off the skewer or spins around……you know what I’m talking about! But, I used bamboo screwers for this recipe and soaked them for a few hours so they didn’t burn during cooking. The biggest part of the recipe, is making sure you have similar size chunks of meat and veggies. I prepped my meat and veggies ahead, so when the time came I just had to skewer them. 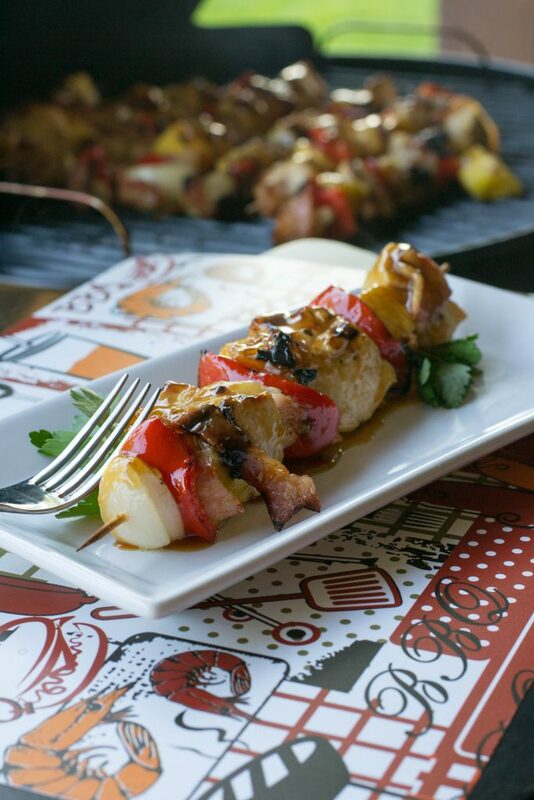 Strips of bacon, woven in-between keeps the meat moist and gives the kabobs that smoky bacon flavor. The real start of the show, is the sauce, sweet and spicy……..pineapple juice, brown sugar, soy sauce, and a nice pinch of red pepper flakes for heat. So, you all know that a pinch wasn’t really how much I used, being the house of spice. But, for normal folks, a pinch will add just the right amount of heat. Cornstarch thickens the sauce and gives it that nice shine you get from cornstarch. 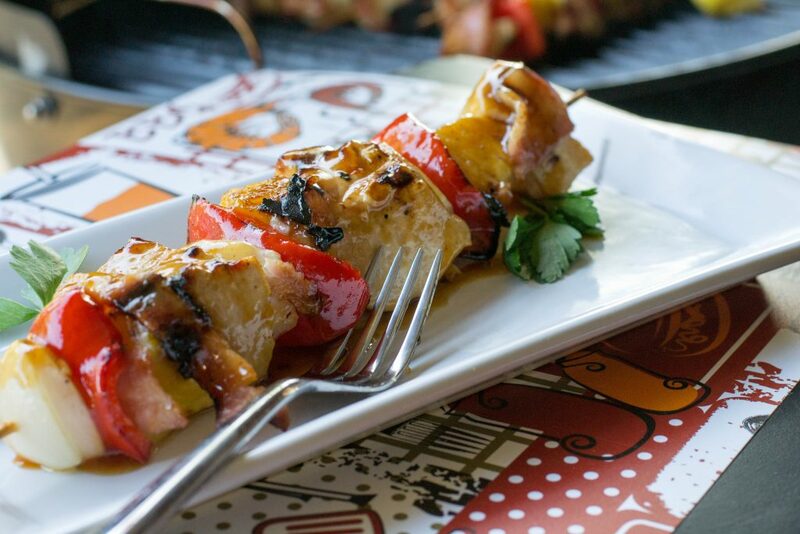 Brush the sauce during just the last few minutes of grilling as the sauce will burn quickly. Serve the extra sauce on the side along with some steam rice and you have a perfect summer meal. 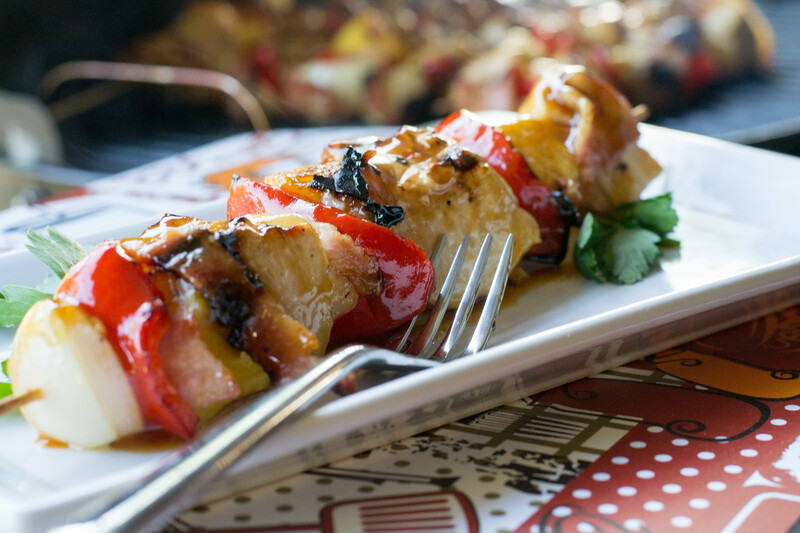 Sweet and Spicy Chicken Kabobs ………get your grill on! Pinch of red pepper flakes or to taste. 6 bamboo skewers, soaked in water for several hours. To make the sauce: Combine cornstarch and brown sugar in a large sauce pan, whisk until combined. Add remaining ingredients and bring the mixture to a boil, reduce the heat to medium and simmer for 2 minutes or until thickened. Set-aside until ready to use. Preheat the grill to medium high. Grill the kabobs for 10-15, turning a couple of times, until done. Serve with remaining sauce and steamed rice.